Graniterock’s northern road materials team played a key role this summer in a massive $1 billion overhaul of one of San Francisco’s main gateways. 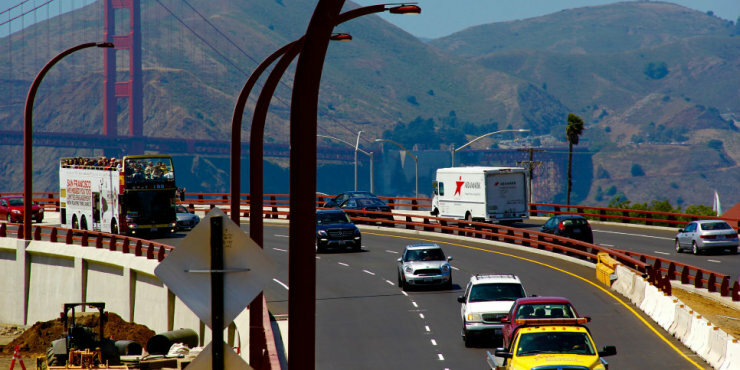 Approximately 41,000 tons of Graniterock asphalt was used to rebuild the Depression-era Doyle Drive, or Highway 101, which connects the Golden Gate Bridge to the city's Marina District. Doyle Drive has been re-envisioned as the Presidio Parkway - a roadway tucked into the natural contours of the Presidioand the Golden Gate National Recreation Area. 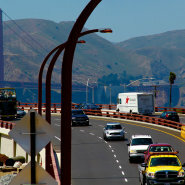 The Presidio Parkway project is a joint venture with Flatiron and Kiewit, with Ghilotti Bros. as the paving contractor. Graniterock has worked successfully with longtime customer Ghilotti Bros. over several months on this job to deliver materials that meet specs and achieve compaction. The 1.5-mile section of road, deemed structurally and seismically deficient before the rebuild, carries 100,000 cars a day and serves as the main route following the bay from the north coast through Presidio Park, a former military base, and into San Francisco. The new transition includes an elevated interchange from the bridge toll plaza, two sets of tunnels and two sets of elevated viaducts. The South San Francisco and Redwood City asphalt plants provided Ghilotti Bros. excellent service and 3,600 tons of the special dense grade during the very tight timeline of the Highway 101 lane closure weekend. Communication was key to the success between the plants and Ghilotti Bros. Many thanks go to Graniterock’s solid team that worked all year on this project. South San Francisco plant: Frank Garcia, Richard Lujan, Jimmy Vehawn, Tiana Corona, George Droogsma, Richard Costello and Roger Langley. Redwood City plant: Dave Voris, Efrain Moreno, Richard Keldsen, Tina Cutter, Stephanie Marley, Luis Rivera, Ezequiel Osornio, Francisco Lara, Jerry Terra and Scott Wilson. Special thanks goes to Kevin McNeil of RTS for pulling double duty testing for both plants whileThanh Ngo was on vacation. The on-call support team included Stuart Mager, John Wilshire, James Wolfe, Rich Maltoni, Donita Granado, Justin Burke and Robert Ellenwood.